U - 128, 750 tons, Type IX-C was sunk off Recife, Brazil, on May 17, 1943, while in pursuit of a southbound convoy, by PBMs 74-P-5 and 74-P-6. Two United Statesdestroyers, Moffett and Jouett, which had been called by the patrol bombers, arrived during the last stages of the sinking. As they came up, the U-boat commander, Oberleutnant1 Steinert, gave the order to abandon ship. U.S.S. Moffett was able to save 51 men out of the total complement of 54. Four of those rescued, including the engineer officer, died aboard the destroyer. Thus 47 men, the commander, his executive officer, two midshipmen and 43 ratings and enlisted men, were landed at Recife on May 18, 1943. Due to the immediate segregation of the officers, petty officers and men and to the efficient handling of the prisoners by the Fourth Fleet, the task of the preliminary interrogation was immeasurably facilitated. 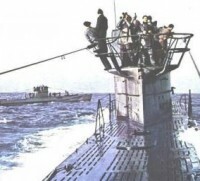 This interrogation was undertaken by qualified interrogators who had been flown from the United States for further questioning.By and large, the security consciousness of most of the crew was somewhat less than that encountered in previous U-boat prisoners, although U-128 had its share of tight-lipped Nazis. No doubt, however, the good treatment they had received played its part in unlimbering some of the prisoners most of whom were happy that for them the war was over. They were, in the words of some prisoners, “very lucky”. Aircraft Commander: Lt(jg) H. C. Carey U.S. Date: May 17, 1943. Time: 08:56 (Zone plus 3). 1. The airplane was flying at an altitude of 6000 feet on a concentrated air-surface hunt for a submarine. Weather was good with unlimited visibility, and scattered clouds. Radar contact was obtained on a fully surfaced submarine 28 miles ahead. Immediately thereafter the submarine was sighted through binoculars. An attack approach at full power was begun without delay, and in a few minutes the submarine started to submerge. At that time it was noted that another plane of the squadron was delivering an attack on the submarine. Passing over the point of submergence about 40 seconds after the first plane’s bombs exploded, the pilot withheld his bombs and began to circle. Soon the submarine was sighted returning to the surface at a range of about one-half mile on the starboard beam. A diving attack was launched, and at an altitude of 100 feet, airspeed about 190 knots, and target angle 2250, six Mark 44 bombs with fuses set to function at 25 feet were released, using intervalometer control with a 72 footcorrected spacing. The resulting explosions bracketed the submarine just forward of the conning tower, and within a minute a series of 20 coordinated strafing runs was begun. During these runs a flashing explosion lasting about one minute was observed to occur just abaft the conning tower of the submarine. The submarine continued on the surface in a down by the stern condition, maneuvering erratically and leaving a trail of oil. Fifty-six minutes after the bombing attack the submarine stopped low in the water, and its crew started to abandon ship. In order to prevent scuttling or manning of the deck guns the plane kept up a continuous strafing. About 10 minutes after the submarine stopped, two surface vessels which had been brought to the scene by the joint effort of both planes arrived and started shelling. The pilot of this plane acted as spotter for the ship’s gunfire. After four direct hits, the submarine nosed over and sank. About 50 survivors were picked up by the surface vessels. The plane remained in the vicinity for three hours and eighteen minutes after the attack, at the end of which time it departed, having received orders from the base to do so. Visibility the morning of May 17, 1943, was excellent and the lookouts were relied upon to warn of approaching planes. The G.S.R. was not mounted partly because the commander would use radar on a clear day. A PBM, 74-P-6, sighted U-128 at 0830 P at a distance of 18 milesand almost simultaneously located her on the radar screen. The approaching airplane had also been seen by the bridge watch on U-128, but when the order to crash dive came, the boat would not dive due to a failure in the high pressure manifold. Prisoners explained that the manifold had worked satisfactorily just shortly before the attack and also mentioned that the indicator board showed that all vents were open. After it was discovered that the vents were still closed, order was given to open them by hand and finally U-128 submerged. Fifteen seconds later, at an altitude of 60 feet, 74-P-6 dropped six Torpex-filled Mark 44 depth charges ahead of the swirl. All six were set at 25 feet. They exploded around the forward part of U-128. The pressure hull was ruptured near the forward starboard torpedo tubes, and water poured in through a four-finger wide gap and also through the forward galley hatch. The electric motors were put out of commission, as was the gyro compass. Diving quickly and somewhat out of control, men were rushed into the aft parts of the boat to maintain trim. As soon as possible the dive was halted, and, realizing that his boat could not remain submerged without danger to the crew, the commander gave the order to blow. About three minutes after the first attack U-128 surfaced. Both diesels were started at once, and at full speed the U-boat made off in the approximate direction of the South American coast. Immediately upon surfacing, the conning tower was opened, and the course to be laid was estimated roughly by the stand of the sun. The order was given to man the anti-aircraft guns, but the other plane in the attack, 74-P-5, had not been reckoned with. This PBM had located the surfaced U-boat on her radar at an estimated distance of about 28 miles, when 74-P-6 had made the original contact at 18 miles. 74-P-5 now made an attack on the fully surfaced U-boat from an altitude of 100 feet, dropping six Torpex-filled Mark 44 depth charges set at 25 feet. This attack increased the damage done to U-128 by the first depth charging, and the following twenty strafing runs made by 74-P-5 prevented an effective defense. The second watch officer and a rating were badly wounded and the commanding officer himself crawled onto the bridge to administer morphine to the second watch officer. Since continued strafing attacks by the planes made conning from the bridge impossible, the steering was done through the after periscope, the forward one having been damaged in the first strafing attack. Although not yet prepared to give up the boat, it was evident to most of the crew assembled in the control room and conning tower that only a miracle could save U-128. Some crew members now were sent up on deck taking cover from the strafing planes behind the conning tower. One prisoner admitted that he had tried to signal the airplane that they were ready to give up, but this was apparently not noticed; similarly, another prisoner said that they were looking for a white sheet to signal surrender, but that no such sheet could be found. At about 0930 P, the U.S.S. Moffett and U.S.S.Jouett were sighted on the horizon by the look-outs on the deck. The order to abandon ship was now given, as was the order to scuttle. At about 0952 P most of the crew was observed to have left the U-boat, but, since no white flag was showing, both destroyers opened fire on the U-boat. The range was about 8500 yards for U.S.S. Jouett and about 5500 yards for U.S.S. Moffett. 247 rounds were expended by both destroyers, which had 74-P-5 acting for them as spotter. Four direct hits were claimed. At 1009 P the U-boat sank in position 11.00 S., 35.43 W. All her vents had been opened but as far as could be ascertained no scuttling charges were set. 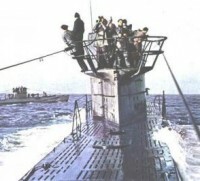 The commander was one of the last to leave his u-boat. It was the opinion of most prisoners that U-128 could have effected repairs to the damage done by the first depth charge attack and might even had gotten away after the second one, had not the destroyers come upon the scene. In connection with the latter, it may be interesting to note that the executive officer of U-128 expressed surprise that neither of the two destroyers attempted to close and board the boat. The U.S.S. Moffett rescued 51 of her crew, four of whom died aboard her. The engineer officer’s death was diagnosed as chlorine poisoning and it is believed that chlorine developed during the latter stages of the sinking. A few superficial wounds from machine gun fire, as well as one inflicted by a shark, were treated on the U.S.S. Moffett, the officers and crew of which received high praise from all prisoners for the good treatment received while aboard her. 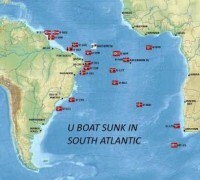 In her career U-128 sunk 12 ships totalling 84 000 tons. They were: Pan Massachussets , South Africa, Andrea Brovig, Polybius, Steel Engineer, Maloja, Cerinthus, Start Point Teesbank, Cities Service Empire ,O. A. Knudsen and Denpark.